Identification: An annual fast-growing weed characterized by viney stems and light-blue/green, triangular leaves measuring 1-3 inches across. Other features include sharp, downward curving spines or barbs on the stems and major leaf veins. These spines can rip into an unsuspecting visitor, hence the name ‘tearthurmb’. Germinating in mid-march to April, the plant will grow a spherical blue fruit (.25 inch diameter) in clusters, which are available from mid-July until November. Each fruit contains a single glossy spherical black seed. Until frost, the plant can grow up to 20 feet length (6 inches per day), bearing about 50-100 seeds. This weed is found along roadsides, wood edges, low meadows and damp stream banks and nurseries. 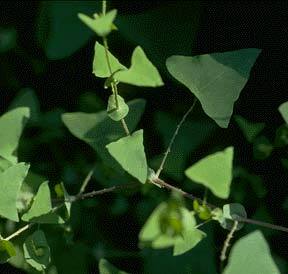 It prefers moist and sunny soil, but can grow in partially shaded woods, growing rapidly over shrubs and other vegetation. Mile-a-minute is native to Japan, Korea, China, Taiwan, Malay Peninsula, India, and Bangladesh. Current Distribution: Mile-a-minute can now be found in Delaware, Maryland, New York, Ohio, Pennsylvania, Virginia, Washington, D.C., West Virginia and most recently (1997) in Connecticut. It is estimated that these sites represent approximately 20% of its possible range due to its ability to thrive in temperate climates. Site and Date of Introduction: The weed was first reported and eliminated in Oregon (1890) and Maryland (1937). In the 1940’s, a subsequent population was allowed to grow and flourish in a York, Pennsylvania nursery. Mode(s) of Introduction: The first introduction was believed to arrive in Oregon on ships ballast. The Pennsylvania spread is traced to seed dispersal through Rhododendron stock. The York, PA nursery owner became interested in the plant and allowed it to grow. Efforts to eradicate the plant were unsuccessful. Reason(s) Why it has Become Established: The plant needs a minimum of an 8 week germination period, which makes the NE U.S. viable. It is a self-pollinating plant that requires no assistance to produce flowers, fruit and seeds. Numerous seeds are produced over a long season from June to November. Birds are the primary means for long distance seed dispersal. Locally, the seeds are spread via ants, chipmunks, squirrel and deer. A hardy plant, it prefers sun and moisture, but can travel great distance over other vegetation using its barbs to climb and locate optimum conditions. The buoyant fruit can also travel great distances down watersheds and streams. Ecological Role: The plant serves as a suitable food source for a diverse group of mammals, birds, and insects. Benefit(s): Other than a food source for wild fauna, there are no known published uses for this plant. Threat(s): Mile-a-minute is able to quickly form dense smothering mats that threaten the survival of the native vegetation and /or nursery tree seedlings. The seed is easily dispersed long distances and has the potential for success in many more regions. The lack of frost, which kills the plant in temperate climates, will enable the plant to eventually become perennial in the warmer regions. Control Level Diagnosis: Highest Priority - Attempts to control mile-a-minute must be continued and enhanced. The plant already covers a huge area and is continuing to spread rapidly. If the plant is not addressed, the rate of spread might increase, resulting in greater ecological damage. Control Methods: The plant spread can be controlled through repeated mowing and hand removal, which stop the flower and fruit growth. However, large-scale areas of the weed may require frequent use of herbicides. Additionally, the maintenance of a stable and thick vegetative community with no gaps or openings can prevent the future establishment of the weed, as it will require some sunlight. Abbey, Tim (May 2000), Mile-a-Minute or Devil’s Tearthumb, Invasive Plant Information Sheet, CT Agricultural Experiment Station. Haber, Erich (April 1999), Mile-a-Minute Fact Sheet, National Botanical Services, Ottawa, ON, Canada. McCormick, Larry H., Mile-a-Minute Weed in the Northeast (1997), Pennsylvania State University, University Park, PA. Okay, Judith A. Gerlach, (23 April 1999). Mile-a-Minute Weed, Virginia Department of Forestry, Fairfax, VA. Plant Conservation Alliance, Alien Plant Working Group.